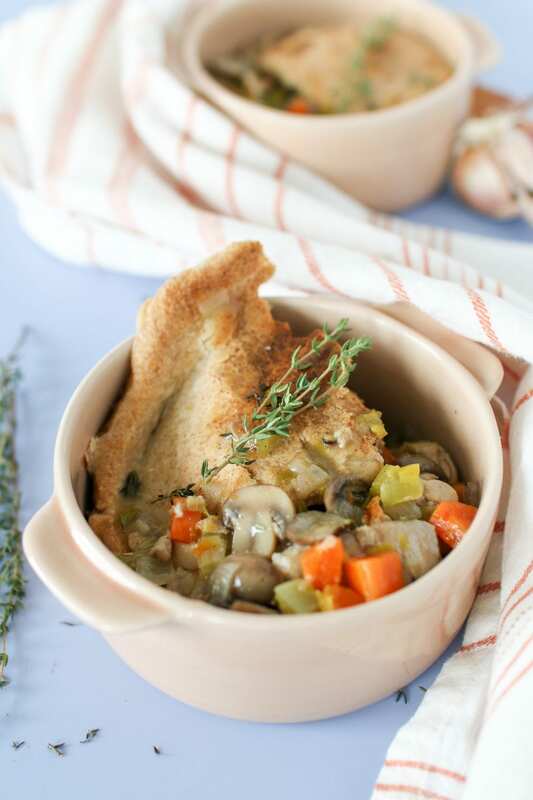 This seriously delicious homemade chicken pot pie loaded with mushrooms and leeks, topped with a flaky spelt flour pastry and fresh thyme, is the perfect comforting meal to enjoy on a cold and wintry night. 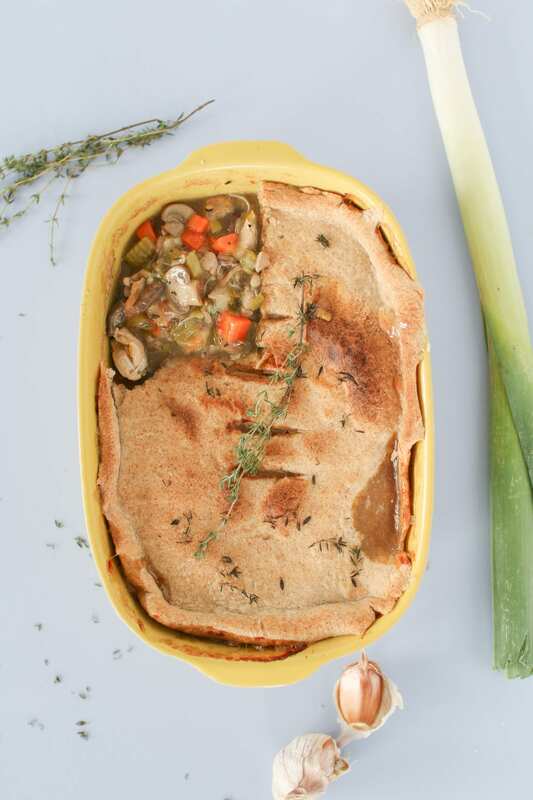 They say patience is a virtue, and when it comes to a great chicken pot pie, patience is everything. 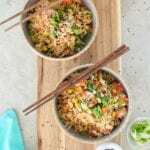 This is definitely not one of my 10 minute quick dinner recipes that I so love to make and share on a regular basis. But the time and effort will be worth it to make this amazing dinner; besides, what else is there to do on a freezing night like we’ve been having here in Canada? I don’t know about you guys, but this is usually about the time that I’m more than ready for spring! Now, back to this delicious recipe. 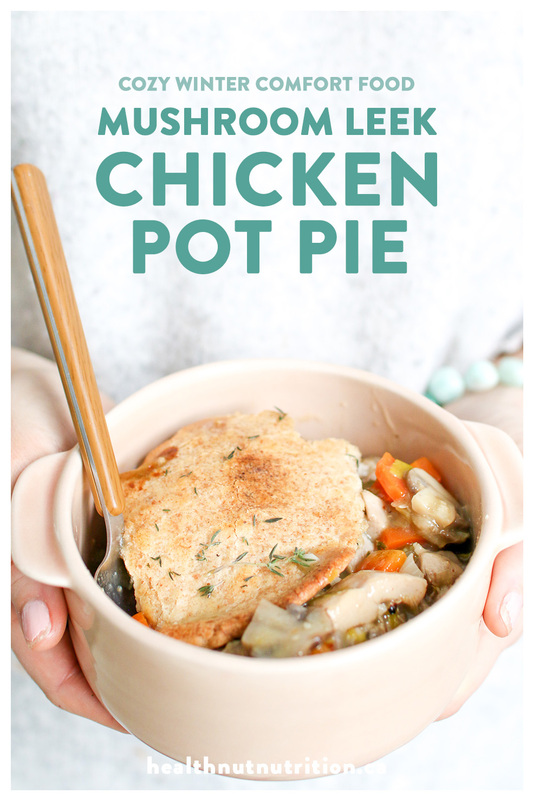 Chicken pot pie has been on my bucket list for quite some time, and I’m so happy to finally share this recipe with you. Matt and I love these kinds of cozy and comforting meals that we can curl up on the couch with while watching our latest Netflix addiction. I know this recipe may seem daunting at first, but I promise you it’s pretty simple, once you break it down. I like to start off with making the dough first, so that it can chill in the fridge while I prepare the yummy filling. I love using chicken thighs for this recipe as I find them to be more tender and flavourful especially when baked up in a pie, and I also feel like thighs just don’t get as much love as chicken breasts…haha. But all kidding aside, if you prefer to use chicken breast, by all means go ahead or better yet, use a mixture of the two. Either way it’s still going to be awesome. I’m also a huge fan of adding a mixture of fresh herbs and spices, especially thyme and sage, which all add a touch of flavour to this dish. 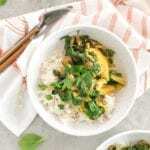 As for fresh veggies, I loaded up on mushrooms and leeks as well as carrots and celery, but you can substitute these ingredients for other veggies such as peas and potatoes. 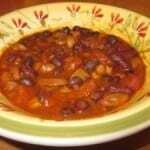 I also like to add a little white wine, or red wine, or even beer to this recipe for a little zing! And guess what? I’ve made this recipe so many times now and I’ve tried all three options and it was delicious every time, so don’t think you have to run out and get white wine specifically. If you prefer your meal to be sans alcohol, than just add more chicken stock and a dash of vinegar. 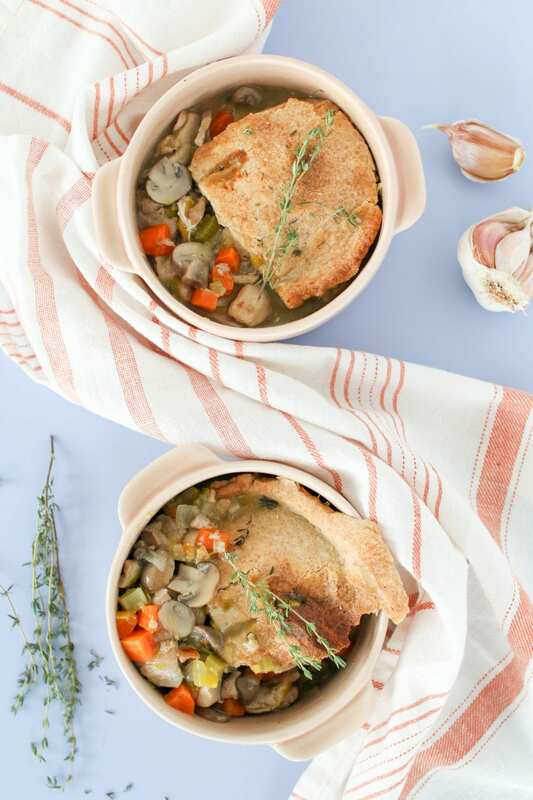 Once everything is cooked, transfer everything into your favourite casserole dish, roll out your dough, then pop it in the oven and before you know it, you got yourself a chicken pot pie! I went with a spelt flour recipe, but feel free to substitute with gluten-free flour if you like! If you’re looking for more cozy comfort food to get you through the rest of the winter, then check out The Best Shepherd’s Pie and Lentil Potato Stew, you’re going to love them!! Let me know in the comments below your favourite way to keep cozy during the winter months! 1 ¾ cups low sodium chicken stock. 1. For the crust: In a food processor, add the spelt flour and salt and process for 2 to 3 seconds. Add the butter and process for 10 to 15 seconds, or until crumbly texture. Add the water 1 tablespoon at a time to the flour and butter mixture and process until dough forms into a ball, about 15 seconds. On a well floured surface, knead the dough a couple of times and shape into a ball. Wrap and place in the fridge to chill while you prepare the pie filling. 2. For the filling: In a large pot, heat the olive oil on medium heat. Add the chicken and brown for 5 to 7 minutes on medium high heat, or until the chicken is browned. Add the thyme, onion powder, sage, chili flakes, salt, pepper and nutmeg and cook for 1 to 2 minutes until fragrant. 3. Add the leeks, onions and garlic and cook for 2 minutes. 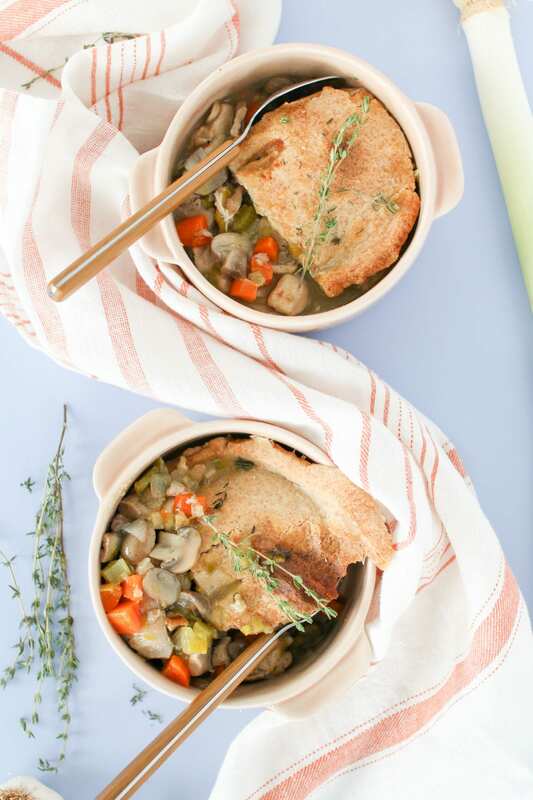 Add the carrots, celery, mushrooms and wine, cook for 6 to 8 minutes until veggies are tender. 4. Sprinkle in the arrowroot flour, stir continuously and cook for 2 minutes. Add the chicken stock, mustard and bayleaf. Stir, bring to a boil, then lower heat to medium-low and simmer for 10 minutes, stirring occasionally. 5. Preheat the oven to 375℉. 6. 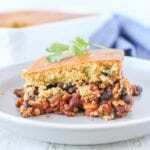 Transfer the filling into a lightly greased 11 X 8 inch baking dish and don’t forget to remove the bay leaf. 7. Remove the dough from the fridge, and on a well floured surface, roll the dough out into a rectangle/oval shape (or the shape of your casserole dish) large enough to cover the pie entirely. Gently transfer the dough on top of the pie and press the pastry against the rim of the pie dish. Prick or make incisions in the crust to allow steam to escape. 8. Sprinkle with fresh thyme leaves and bake for 20 to 25 minutes, until top is golden.Optional, you can even broil it for the last 3-5 minutes for that perfect golden brown top. Let the pie cool on a wire rack for about 10 minutes before serving. Store any leftovers in an airtight container, or simply cover the casserole dish you baked it in, and store in the fridge for up to 3 days. *To prepare the leek, trim off the root and coarse dark green top. Then, cut the leek lengthways and wash under running water, making sure you get in between all the layers to get any soil or dirt trapped inside.